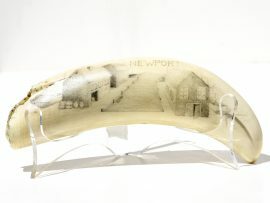 “Humpback Whale Chillin’ ” black and white scrimshaw on ancient walrus tooth ivory by Gerry Dupont. This beautiful humpback is just taking it easy, well below the surface and safe in its own realm. Nice work by well known scrimshander.